Click the drop down under BOOKS to discover more information about each publication. "Can U Read, Judge Landis?" 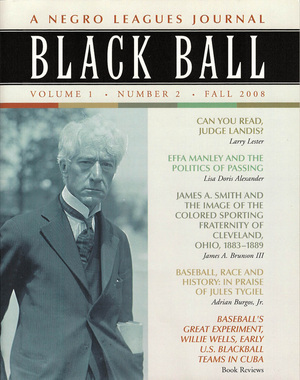 TRUTH, LIES & ALIBIS: Was Commissioner Kenesaw Mountain Landis baseball's gatekeeper of segregation? Was he the "Leader of the Resistance" or a hostage to social norms? What is Landis's true legacy to our National Pastime? Read Lester's perspective of how the "Gentlemen's Agreement" kept African Americans out of Major League baseball, from 1885 to 1946, more than 60 years. - Edmund Burke, (1729-1797), Irish philosopher. "Racism is a scholarly pursuit, it's taught, it's institutionalized." Download a Fact Sheet for published books by Mr. Lester. 1827 - Freedom's Journal, the first African-American owned newspaper's mission statement; "We wish to plead our own cause. Too long have others spoken for us. Too long has the public been deceived by misrepresentation in things which concern us dearly."